Everyone knows what a mill looks like. But do you also know what a mill looks like from the inside and how it works? Look through the walls of the mill and discover what you’ll see once you’ve entered the mill. Molen de Valk (The Falcon) is a tower mill, dating from 1743. The current mill succeeded a wooden mill, which was erected in 1667. The new, stone mill had to accommodate two families and had to be high enough to rise above the houses in its surroundings in order to catch enough wind. The ground floor and the additional building contained the kitchens, living areas and stable of the two houses. The sleeping rooms where located on the first and second floor, while the third served as storage room. The milling activities took place in the spaces located from the fourth floor (14 metres) to the top of the mill (29 metres). The top floor of the mill is called the cap (or cap loft) and this is the actual roof of the mill. To catch the best winds, the cap can be turned in each direction possible. A large round bearing with pockwood rollers makes this possible. The sail axle turns in the cap with the brake wheel above it. The latter is a wooden wheel with a diameter of three metres and the brake pads of the mill are located around it. The cap loft is not open to the public as the many moving parts make it too dangerous. The name of this loft refers to the hoisting mechanism used to lift the sacks of grain to the top of the mill by wind power. This occurs inside the mill via a system of hatches positioned all in one line. The sacks of flour are also transported out of the grinding loft via these hatches. The hoisted grain is transferred into storage silos from this loft. The Stone Loft is the place where pairs of millstones take care of the grinding. The upper stone turns, driven by the sail axle, whilst the stone beneath it is fixed to the floor. The grain comes out of a storage silo suspended from the ceiling above and passes between the stones through a hole in the middle of the upper stone. Grooves between the stones ensure that the flour is finely ground and directed towards the edge of the stones. These grooves are applied to the stone by the miller himself using a 'mill bill' and have to be reworked on a regular basis. There used to be four pairs of millstones, grinding different kinds of flour, but only one is still active nowadays. This is the miller's workspace. He can enter the gallery through one of the three doors. From the gallery he can inspect the weather and turn the cap into the wind or set extra or fewer sails to adjust the speed of the mill. Inside the grinding loft, the sacks are filled and weighed and the miller can test and somewhat influence the quality of the flour that comes down the chutes from the ceiling (the Stone Loft). The first, second and third floor have been turned into exhibition rooms. 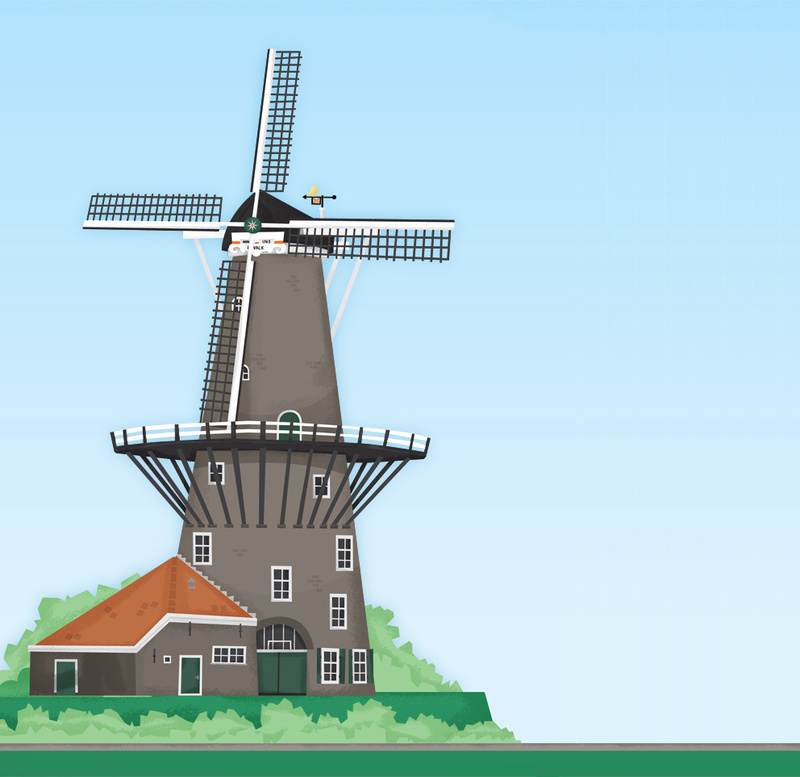 On the first floor you’ll find the exhibition ‘The mill, the symbol of Holland’. It contains display cabinets featuring tools, books and equipment associated with milling. A movie about mills in Holland can also be seen here. On the second floor the exhibit continues with subjects such as the Leiden millers' guild, the mills of Leiden and the history of De Valk. The third floor tells you the entire history of grain grinding and a number of splendid models of different types of mills, such as a tower mill, a sawmill and various types of polder draining mills can be admired here. The only remaining town miller's residence in the Netherlands has been kept largely intact on the ground floor. The almost complete original furnishings take the visitor back in time to 1900. Eighteenth-century delftware tiles with pictures of children's games, amongst others, can be seen above the sink in the kitchen. There is also an old wood/coal stove. The living room contains many family portraits and pictures of mills and family coats. This provides evidence of the interest the last miller showed in genealogy. The walls of the drawing room or green room are also mainly decorated by family portraits. This room was only used on Sundays and public holidays.